Trump’s announcement Sunday drew quick pushback from legal analysts who said he lacked the authority to make the move — as long as Grady remains in her post. When Nielsen tweeted late Sunday that she planned to remain in her job until Wednesday despite her resignation letter appearing to be effective Sunday, some lawyers said it was a sign that attorneys inside the administration had discovered the same legal hitch. “They must have realized late last night how Trump incompetently botched the naming of her successor without having someone check the statute,” conservative lawyer and frequent Trump critic George Conway wrote on Twitter. A legal scholar who focuses on the presidential use of temporary appointment powers said Monday that the law governing the Department of Homeland Security lacked the ambiguity of the statutes at work in other fights the Trump administration has faced over “acting” appointments, like Trump’s use of the Vacancies Reform Act to tap of Mick Mulvaney to temporarily head the Consumer Financial Protection Bureau and Matthew Whitaker to serve as acting attorney general. “In neither the DOJ case nor the CFPB case did the agency-specific statute explicitly exclude the Vacancies Act and the DHS statute does,” said Stanford Law Professor Anne Joseph O’Connell. She said while she disagreed with those moves, Trump was legally in the clear, but not this time. “This is the example of where the Vacancies Act would not apply. If you have a confirmed undersecretary of management, you have to use them,” O’Connell added. O’Connell and other experts said Trump still has one clear route to get the man he wants in the top DHS job: Fire Grady, creating vacancies in all three of the department’s top positions. While she was a career civil servant, her current job is a political appointment, so the president can fire her at will. “She has no protection from removal. So, the only cost is a political cost, but I hope there will be a political cost,” the professor said. Spokespeople for the White House, the Department of Homeland Security and the Justice Department did not respond to inquiries Monday about Grady’s status and Trump’s legal authority to install an acting DHS secretary while Grady remains in her post. 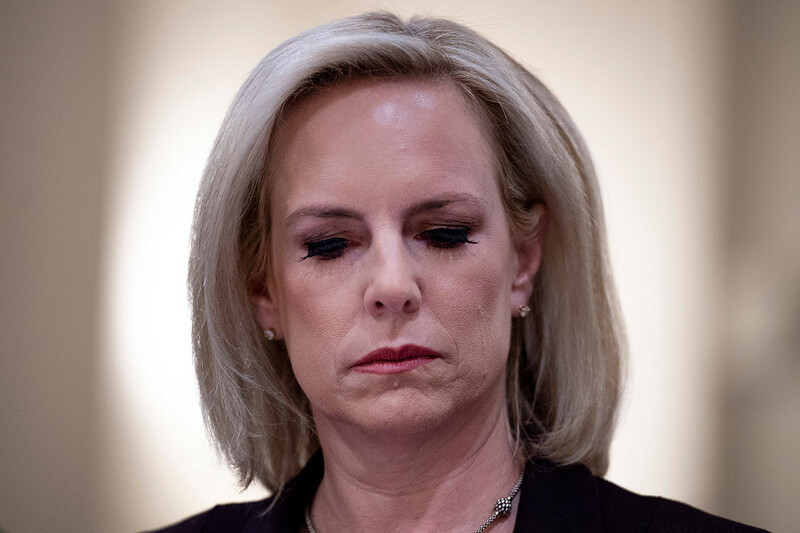 Initial stories on Nielsen’s resignation said Grady was unwilling to step down, but several news reports say that in order to implement a major overhaul of DHS leadership, Trump is moving to get her out of her current job — by firing if necessary. When Trump named Whitaker as acting attorney general last November following the resignation of Attorney General Jeff Sessions, the Justice Department released a legal opinion from its Office of Legal Counsel defending Trump’s authority to bypass the order of succession set by statute and a Justice Department directive. No such legal opinion has emerged from the administration as of yet claiming that Trump could install an acting DHS head while Grady remains on the job. O’Connell joked Monday that the turnover among Trump administration appointees and the president’s penchant for departing from the usual order of succession have suddenly put her unusual specialty in the spotlight. “For a long time, I toiled in obscurity on this, but this president has made it president has made it popular,” she said.